At the heart of nearly all great high-end cooking—regardless of cuisine, culture or style—is simplicity. It may seem somewhat counterintuitive: Elaborate dishes, exotic preparations, luxury ingredients and ultra-modernist techniques = simple? And yet, restaurants like Jean-Georges in New York, Alinea in Chicago and Alma in Los Angeles have one thing in common: simplicity. And Chef Carl Schroeder’s food at Market Restaurant + Bar (3702 Via de la Valle in Del Mar) bears the same mark of simplicity. Take, for example, the miso-glazed local black cod with gingered dumplings. The fish, beautifully caramelized on the outside and moist inside, was paired with dumplings that echoed the textural contrasts in a distinctly different way. These were set off against roasted shiitake mushroom, tempura green beans and a dashi-ponzu foam. Each highlighted the Japanese theme in a playful way. Everything on the plate was there for a reason. Also quite good, if somewhat less simple, was the Alaskan troll king salmon and lobster-prawn tortellini. 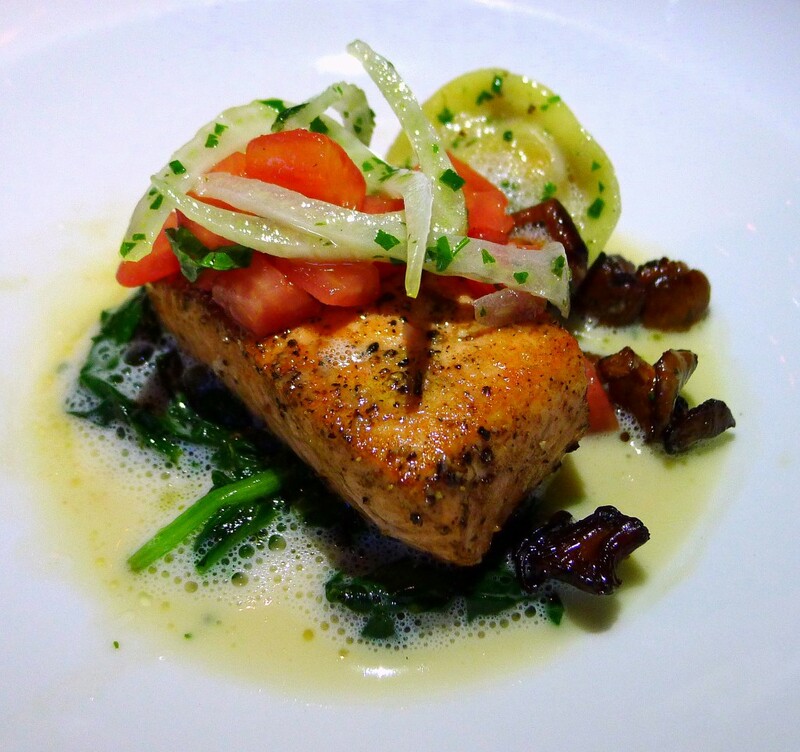 Schroeder, it seems, has a particularly deft hand with fish, coaxing out all of its inherent richness—in this case assisted by the tortellini—without sacrificing any moistness or texture. He paired these with a refreshing pickled-fennel salad, tomato-caper relish, chanterelle mushrooms and a Chardonnay emulsion. Nor does Schroeder give red meat short shrift. One fixture on his menus—which change every night—is a spice-roasted rack of lamb, which he generally pairs with chutney (peach on a recent visit). This he served over a fennel purée along with white-cheddar braised potatoes, broccolini and a lamb jus. The dish was defined by interplay between the lamb, the chutney and the jus, the spice and sweetness of the chutney pulling one way, the earthiness of the lamb the other and the jus elevating the whole affair. Another regular on Market’s menus is grilled prime steak with a Cabernet reduction and potato-leek cake. This is not wildly creative. It is, however, tremendously tasty. Cabernet is also featured in one of Schroeder’s signature dishes: Cabernet-braised short ribs served over a sweet-onion potato purée with shishito peppers that made the entire dish pop. It was a standout. Desserts at Market, the domain of James Foran, are well worth the calories. His S’mores Bar is a chocolate mousse with toasted marshmallow, cocoa chiffon and caramel ice cream. But the real kicker to the dessert was the addition of an overtly savory applewood-smoked sea salt. The Ricotta cheesecake with walnut crust, spiced honey-plum sorbet and shredded phyllo might not have been as surprising, but it was a terrific end to the meal.